COLD COMFORT: Angler Elvio with his big offshore winter snapper. Bream were prevalent across Geelong’s waterfront over the past week, with anglers landing fish from 30cm to 40cm while fishing around boats and structure. Small yabbies and crabs were stand-out baits, although some bream took lures as well. Snotty trevalla were present along the waterfront, with Cunningham Pier a hot spot. Chicken baits suspended under a float and cast close to the pier is always a good tactic. Garfish were again caught throughout Corio Bay’s inner-harbour on pippie and small bits of squid. The odd big snapper was also caught in the bay by anglers willing to fish after dark. The key is to fish baits like garfish or squid as lightly as possible because the bay’s snapper can be finicky through winter. The Barwon River continued producing mulloway. Some fish were even caught from the bank, with lures, live baits like salmon, mullet or squid, and even pilchards worth using. Queenscliff was good for squid again. Anglers fishing the pier had success on squid to more than 2kg with baited jigs using pilchard. Nearby, Queenscliff Harbour had silver trevally and salmon on offer. 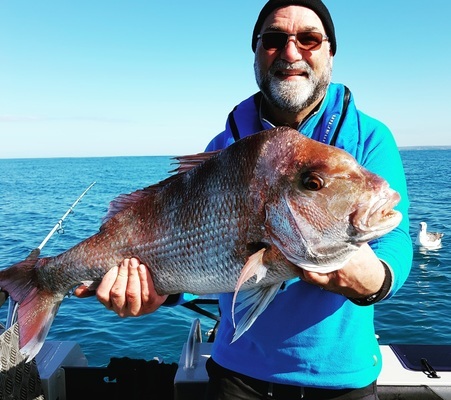 Offshore anglers reported some fantastic captures of gummy sharks and snapper exceeding 8kg. The stretch between Barwon Heads Bluff through to Torquay, in particular the foul grounds, was the most -roductive. Alikz and father Elvio fished Saturday, managing a magnificent snapper caught on salmon. All fresh baits, like salmon fillets and squid, should produce results while fishing at anchor or drifting. Fishing from rock platforms and beaches right across the coast from Anglesea to Apollo Bay was a good option, with reports suggesting salmon were present in good numbers. Casting metal lures or using pilchards or bluebait should tempt fish to potentially 2kg. Trout fishing continued to be fantastic across the region, with Lake Bullen Merri one of the better lakes to focus on. Trolling the lake’s edge with pink Tassie Devils or casting Power bait from the bank were both productive. Anglers after a feed of redfin needed look no further than Lake Purrumbete where reddies remained in plague proportions. Dropping soft plastics into thick schools of fish, once located, worked well.